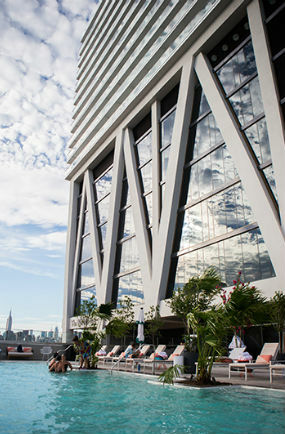 Yoel Goldman’s All Year Management is looking to raise up to $166 million in Tel Aviv bonds that will be backed by the recently completed William Vale hotel in Williamsburg. The $166 million represents 66 percent of the property’s value, documents filed with the Tel Aviv Stock Exchange show. Goldman is expected to be in Israel this week to market the strategy and would need to garner demand of at least $80 million for the issue to go through, according to sources and documents. This is Goldman’s third time issuing bonds on the market, but it’s the first time a U.S.-based company is issuing a bond guaranteed by a first mortgage. Previously, all 18 U.S.-based companies who raised money in Israel issued corporate bonds that were backed by a portfolio. If All Year is successful in raising funds against a specific asset, it could open up the market to similar attempts in the future, market insiders said. All Year owns a 50 percent stake in the William Vale, a 21-story hotel at 55 Wythe Street, which it will include in the entity used to issue bonds in Israel. (Developer Zelig Weiss owns the other 50 percent.) The hotel, which opened in September, also contains 45,000 square feet of event space and 35,000 square feet of retail space. The project’s ownership is divided into an operating company and a property company, a typical structure for hotels, which are heavily reliant on operating revenues. In this case, the operating company has signed a 15-year lease at a flat rate of $15 million per year, plus an additional 1.5 percent of NOI if income exceeds $50 million, the documents show.